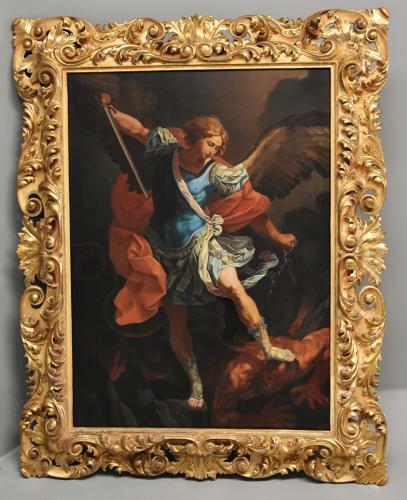 This painting is after the original 'Michael defeating Satan', painted in 1636, depicting the winged Archangel Michael or St Michael slaying Satan in heaven, the original painted by Guido Reni (1577-1642) and in Santa Maria della Concezione church in Rome. Reni who was an Italian painter who mainly painted religious subjects as well as mythological and allegorical ones. In the New Testament Michael leads the armies of God against a war against Satan in heaven where Michael, being the stronger of the two, defeats Satan. Michael is specifically referred to as "the archangel Michael" and Christian sanctuaries appeared in the 4th century where he was first seen as a healing angel, and over time as protector and leader of the army of God against the forces of evil - by the 6th century devotions to Archangel Michael were widespread both in churches in both the East and West. This painting is in excellent condition, relined and framed within a superb pierced and carved gilt wood Florentine frame.